We use business as a platform to build people of higher character. 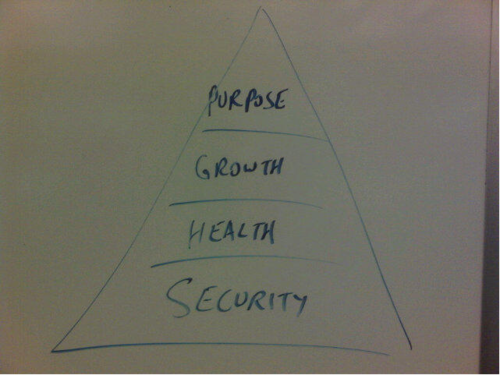 It's profound how much we believe and LIVE this simple diagram at Next Jump. Maslow's Hierarchy of Needs is a theory in psychology proposed by Abraham Maslow in his 1943 paper "A Theory of Human Motivation." The hierarchy started with Food & Shelter, Emotional Needs, Mental/Intellectual and ended with Self-Actualization at the top of the pyramid. 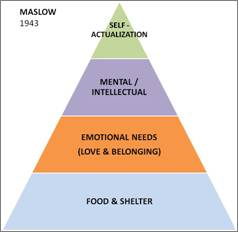 Maslow created a framework for what human beings needed to succeed and feel fulfilled in life. That was in the 1900s, in the manufacturing age when 80 percent of the country earned its living working at a factory. Fast forward to today, the information age, the greatest asset of every company is its people. So what is the updated framework for fulfilled happy human beings? At the bottom of the new pyramid is SECURITY. That includes financial security, job security, family security, group security. When we don't have this, we feel like we're drowning, under water, unable to breath. Read two great posts about Next Jump's "No Firing Policy" by David Marquet, author of Turn the Ship Around and "Happiness at work at Next Jump" by Alex Kjerulf, author of Happy Hour is 9 to 5. Next is our HEALTH. When we're in our early 20s, nobody gives it much thought. We abuse our bodies, sleep late, eat late and bounce right back. However, science has discovered that starting at 25 years old, the human body is starting to deteriorate; it's "slowly dying." It's kind of depressing but true -- when you wake up one day, doing the same things you've done, and realize, I need to eat better, exercise more regularly and sleep better. The good news is that our body is a vehicle that has the capacity for infinite upgrades. Sleep, exercise and nutrition are the foundations of this upgrade. And when you do this starting earlier, you have your health later in life. Gabe Zichermann featured Next Jump's Enterprise Gamification of Fitness as a keynote at the GSummit gamification conference. The NY Times loved touring our health and fitness facilities at Next Jump and produced a short video: Gaming Workplace Workouts. Shortly after, Jet Blue picked up the video and played it on their TV terminals for flights coming into NYC. Also a great blog post by NxJumper Kate on: How I Lost Weight at Work. After having security and health, comes GROWTH. We call this Better Me. Learning and getting better, building mastery...it's incredibly addictive. We tend to stay in organizations that focus on our education, our growth. Two great blog posts by NxJumpers on how they've grown: Finding My Voice at Next Jump and NxJU: Turning the Workplace into a Classroom. We discovered that Teaching is the most accelerated form of Learning. When you teach someone something you know, it makes you learn it at a whole different level. And teaching for inspiration is one thing. But a higher standard is Teaching for Adoption. Changing people's lives, their rituals and habits, how they act vs just how they think. Watch this great video of our Chief of Staff, Meghan, teach how to do PR for all startups: The Magic PR Circle, starting with our mistakes and lessons learned. Lastly is PURPOSE. Why are we on this planet? When we're 80 years old, looking back at our life, thinking about what matters most, what was it all about. It always boils down to one thing, the impact we had on the lives of others. We call this Better You. Who we helped, what we gave away. My mother always said, "All the money, all the material things..you can't take those to your grave." Watch this video presentation to a room full of entrepreneurs on "How to take care of yourself before you take care of others". We have so much to do before leaving this planet..to dramatically change the world in a positive way. One for one isn't good enough, we want to impact millions, maybe even billions. We started with our Code For A Cause (CFAC), giving away our expertise, something better than money. Read two great posts by the captains of recent CFAC initiatives: A New Philantrophy - Donating Our Best Asset: Our People and Corporations Can Create a Better World. Other Better You programs include: Vendor Appreciation Day for holiday gifts, contributing 10% of our salaries to the forgotten population during Hurricane Sandy, as well as becoming one of the largest contributors to DonorsChoose.org and visiting some of the schools we impacted: School Trip with Laura. Our most recent Better You program is: Adopt A Charity - what if every successful for-profit company partnered with a quality non-profit? Picture thousands of companies doing this. We're investing in staff development programs for charities which will pay far more dividends and will give back in perpetuity. A great blog post on this initiative "Outrageous Generosity" by Will Marre, co-founder of Covey Leadership w/ the late Stephen Covey. Build an environment that does this well, your people will feel more connected to other people, like themselves more, increase self-esteem, focus on contributions bigger than themselves. Getting better as a human being. At Next Jump we say: "We use business as a platform to build people of higher character". When we got this right, our turnover in engineers went from 40% down to 1% and has held steady for nearly 18 months. As I said in the beginning, Maslow's Hierarchy of Needs, was for a different time. This version works for us...what version will work for you?